Hanging out with friends late, late, late the other night, dim music on in the background, splayed haphazardly on a fat, squishy couch, my brother-in-law Dee suddenly started waxing nostalgic about his family’s big, old 1991 white Chevy Suburban. He just broke into it, too. His wistful, late-night rambles got me thinking. For my sister Nina and I, nothing would beat sitting in the backseat of our old 1984 Pontiac Station Wagon with brown paint, brown interior, and a classy fake wood trim on the outside. The backseat in this Logmobile was about eight feet away from the driver, but a world apart really. You could talk and play games out of earshot, all the while looking and laughing straight out the back window, distracting the people behind you on the highway. In the summer the metal belt buckles would grow red-hot and scald your skin when you tried to buckle up. The cup holders were always full of sticky remains from the half-dozen spilled Cokes that were never fully sponged up by the handful of McDonald’s napkins stuffed in there. The A/C was temperamental, the windows wouldn’t roll down all the way, and there were no DVD players entertaining you, no GPS voices guiding you. You’d just clamp up, invent your own fun, and sit patiently on the dark, fabric seats, deeply stained from that time somebody sat on a banana. So — what was your car? Was it a 1969 Dodge Dart? A 1990 Chevette in Classic Dull Grey or 1995 Chevy Lumina van? Was it a monstrous 1968 Impala, a 1954 Desoto, or a 1991 Ford “Feel The Teal” Taurus? Whatever it was, I bet it sure does give you a trip down memory lane when you see the car you grew up in, the same color, the same style, the same model, just driving around town like nobody’s business. Or maybe just fixed up real pretty at an antique car show. Or maybe just calmly coasting on cruise through your brain once in a while. I dont know if that is true but in these tough times I got a vehicle with manual windows to save gas. Black dodge aries 2 door, manual. Weird, i ended up owning one when i’s all growed up!…uhgg, “I’ve thought turned into my father”! It turned out to be a pretty dependable easy to fix car though! we had a dorky minivan with some annoying electrical problems. Every time we turned left, the lights would flash on and off and the ‘door ajar’ bell would ring. We had the exact same problems with our minivan! The doors would often lock then unlock themselves several times in a 2 min period. I always wondered what it looked like to other people, driving down the road at night with the interior lights constently flashing. I had 2: First was my mom’s ughly gray 1994-ish Nissan Stanza. It had every detail explained by Neil, even the hot buckles. It was affectionaly referred to as “Old Gray Acorn” from some Little Golden Book Christmas Book that I read as a young lad. She had that for about 11 years before selling it, and it lasted another 2 before finally dying a painless death. The second was my dad’s 1997 Mitsubishi Gallant, which was the go-to car for long roadtrips. It also achieved something that deserves an awesome entry in its own right: When the “family car growing up” became my first car. an ’88 or ’89 blue Grand Marquis Station Wagon with fake wood paneling on the outside. Three in the front, three in the back, and four in the “way back” the seats that folded up from the floor of the trunk and opened to face each other. You could get nailed straight on from the side and be fine because of how big this car was. Hokey smoke, we had the same car, same color, and the kids called the second seat “the back” and the third seat “the way back”! You’re right, it was built like Herkimer battle jitney and driving it was like driving a bowl of soup. Damn I loved that car. We called ours the Ectomobile. I’m showing my age on this one, but it was a 1978 Ford LTD station wagon, white with fake wood. It had the luggage rack and the flip up covers over the headlights. It was actually kind of like the National Lampoon Vista Cruiser. That thing must have weighed a ton. It had a V8 though to get it moving. An ’88 Toyota Tercel Wagon with rusted out bits on the back that looked like bullet holes, earning it the nickname “Mafia-Mobile”. I learned to drive on that car and it never gave us any trouble… but imagine, if you will, 3 teenagers in the back on a 1200 km road trip (each way!) with no airconditioning… in July! An old sage brush green Rambler wagon, probably a ’68 or ’69, just before they stopped making them. We rode in the back, no seat belts, no airbags, no problem. My favorite though, was Dad’s ’73 Ford F250. Learned to drive a stick on that thing. 1974 Orange VW Bus with no middle seat so my sister and I could run around the back (safety first! ), but the bolt holes where the seat was had rusted out so we could push stuff out of the holes and watch it come out the back of the car as we ‘sped’ down the freeway at 50 MPH. Also, the drivers side door could not be opened because the hinges had rusted, and it would fall off, and when you turned on the right blinker, it would honk. Very Little Miss Sunshine! Ours was a tan Dodge minivan. I don’t remember the year, but there were the two bench seats – the one towards the front was shorter to provide access to the one sliding door on the side – and the back windows only opened up a tiny crack. My brother and I used to fight over who got to sit in “the way back” during long car trips. Next to the seats in the car itself were these shallow plastic pockets, probably some luxury contraptions for people to store books or maps. We used them to store McDonald’s food during our trips. Months later we would find petrified fries deep in the corners, most likely evolving into some intelligent being. Mine was the good old ’87 Ford Aerostar. Which incidentally looked just like the ’97 model. I remember road trips back and forth from Colorado to California, my sisters convincing me that if I put my finger in the cigarette lighter, it wouldn’t burn… Doing donuts in the parking lot of the King Soopers in the snow while my mom screamed “wee!” and we held on for dear life, praying the sliding door didn’t magically swing open like it usually did. Also, using McDonald’s drink lids as makeshift steering wheels with the Diet Coke, Coke, and Rootbeer buttons sufficing as the turn signals and windshield wiper button. All this so I could pretend like I was adult. Ha! Grey, ’87 Colt Vista. I remember it well. This is such a great post! My mom drove a hideous brown AMC Pacer, but we both loved it because it was so roomy inside. 1997 Ford Windstar. pastel green. We had a succession of used Dodge vehicles, known as “the blue car”, “the black car”, “the red car” and “the van”. All of them had vinyl seats that made you sweat in summer, and no a/c. When it was really hot, we’d have to put a towel down to sit on, so our bare legs wouldn’t burn on contact. The black car was particularly brutal. My dad developed an obsession for “the shady spot” and would go to extreme measures to secure one. My family had an old school Chevy Malibu, all white, with maroon interior. I hadn’t even remembered how hot those metal seatbelt buckles got until you reminded me. My family had a 1983 royal blue Mercedes Wagon. It was awesome. Eventually, everything started to go: the middle of the backseat became a trampoline over every bump in the road; the tape player munched happily on any tape we fed to it; the handle to the hatchback broke off and was never replaced, so if you wanted to ride back there you had to knock on the door and hope that someone would let you out. My mother had a 1973 Chevy Belair, aka the Bomb. It whined every time it went past a gas station. Thise vinyl seats would absolutely scald you when it got hot. My stepdad had a 1967 Chevy Impala Super Sport. I cried when he sold that car….I think that is the reason I still don’t drive, and I am 38!!!! My learn-to-drive car – a ’56 Chevy Belair, cream and aqua paint, three-on-the-tree, straight-six engine, enough room to walk around in under the hood, gas cap hidden under the left tail light, fun at gas stations watching the pump jockey looking for the gas cap. Hmmm, anybody reading this remember full-service gas stations? Pump your gas, check under the hood, AND clean your windshield? You got it exactly right with the 1991 Ford Taurus. It was a white station wagon that my parents hated because it leaked transmission fluid and got awful gas millage. I loved that car so very much, sitting in the back-back making faces at the cars behind us, waving to everyone and cheering when we got a wave back…. When we sold the car I shed many a tear…. Oohhh…my dad had a mid-80’s AMC Eagle wagon with the vinyl seats. Hot as hell in the summer, and freeze yer buns in the winter. I also remember the makeshift seatcovers made from beachtowels. Niiice. My mom’s was an 88 Chevy Celebrity that did eventually become mine…until I cracked her up. oops. We had a white 91 Toyota Camary. It had door handles that me and my cousin thought looked like joysticks, and we used to pretend we were flying x-wings. Nothing beats my Mom’s 1997 Nissan quest, sold for parts just last year. I grew up in that car. We had ‘assigned seats’ from when my sister and I had lice in the hopes that my brother wouldn’t get it, and we never gave that up. I ate countless McDonald’s meals, carried so many school projects… that was the greatest car ever. Now we are vehicle-less and, now that it’s winter and I have to walk to school, I miss that car more than ever. A yellow Volvo station wagon from the early/mid 80s. Because it was yellow, we called it the Banana Wagon. My mom died years ago, and I got a lump in my throat when I found a picture of the same make and model on Google images. The color is not quite right, but it still brings back strong emotional memories. We had several that I can remember. Most prominent was a 1953 Studebaker that was mug fugly pink. My sister and hide when we had to ride in the “stupid-aker.” Then my father went through a mid-life crisis and we got a 1968 Dodge Super Bee –which was only a 2 door so we had to climb into the back seat. The best was my grandparents who had the “old buick (1943)” and the “new buick(1961).” I was really angry when they died in 1981 and my parents gave away the “new buick” which was only driven 1 day per week to church on Sundays. It had 27K original miles on it. The “old buick” went to the salvage yard..driven there.. yes my parents were not very worldly and therefore didn’t know they were sitting on a cultural goldmine. Mine WAS a 1995 Chevy Lumina minivan. Oh, wow-we had the exact same Pontiac station wagon when I was growing up, I think! Ours was a Sunbird that we named Herbie, despite its utter lack of resemblance to a VW Beetle, and it looked just like you described. One of my happiest childhood memories involves squishing into the “way-back” with about 9 of my friends and driving to a local indoor waterpark for my 10th b-day. Thanks for reminding me of the sheer awesomeness of Herbie! 1974 Dodge Aspen Station wagon – Silver with blue vinyl seats that had some strange pattern that would imprint your legs when you sat on them in the summer. By the time my parents got rid of it circa 1986, it was rusted from three Ohio winters, the seat belts in the back seat had long been lost to the crumb-filled netherworld between the seat back and seat bench, and I was so embarrassed to be seen in it, I would crouch down on the floor when we went anywhere. It had a luggage rack, and I remember many a vacation where my dad would get up 2 hours early to load all of our luggage on top, cover it with a blue tarp and secure it with yellow rope. I also remember drawing many imaginary Mason-Dixon, Maginot line war boundaries between me and my brothers. And as the youngest, I always had to sit with my feet on the GIANT hump in the back. 1989 Volvo and a 86′ Mercedes. Pack 3 kids in the rear seat and those kids will have movement space!! 1989 Volvo 740 station wagon! Great times being crammed in the extra backward facing-trunk seats, waving at strangers with all my cousins. Hello from Wexford Ireland, I enjoyed the article. Very Good. 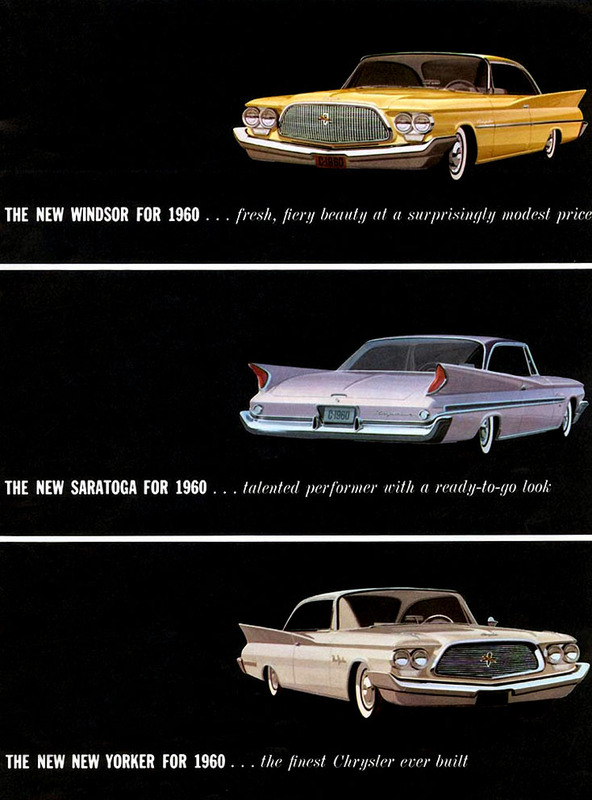 When my parents decided to get a second car we got a 1960 Chrysler Windsor. It had huge tail fins, I could do chin-ups(pull-ups) on them. My mom called it “Old Betsy” until some guy said, “That ain’t no Old Betsy that’s a Crazy Alice” so from then on it was named “Crazy Alice.”. I learned to drive in my mom’s 1974 Dodge Dart (318-V8). It later became my car. It was brown and gray. The gray was duct tape over the rust holes. My mom’s 1974 AMC Gremlin. That thing went fast! My older brother got it when he started to drive then I got it when I started to drive. That thing always broke down but NEVER away from home. Just when you were pulling in to the driveway, it would die. It would never leave you hanging when you needed to get home! Brown ’81 Ford 250 Ranger Extended cab, smash up to seven of us in the back and abut four in the front. and sometimes we got to ride in the bed sardine style. I still drive the old thing around, people always reconize, not me, but my big, brown yacht of a truck. Oh, and it’s gets 8 mpg, it’s that old. I only drive it for camping. My parents had a 80’s Reliant that we finally gave up on when the engine mounts rusted through and the engine fell to the ground when we were on the on ramp to the highway. Luckily my dad had it taken to his work, where he’s a welder. He remounted the engine and started looking for the next vehicle! 1961 Mint green Chrysler Imperial… electric windows, power seats….huge fins in the back with tail lights the size of an Olympic torch. It was huge!!!!! and no doubt a gas guzzler. Riding at 75 80 mph, which was the speed limit at the time, was a thrill. Makes for great memories! My parents drove a white Dodge Omni with red seats. One day the digital clock went haywire and was showing random weird times. Like 88:88!! Anyway we would go on road trips and listen to tapes – We are the World had a great tape, Big Chill Soundtrack, Phil Collins – No Jacket Required, Stand By Me Soundtrack… What memories!!! Ford 1956 stationwagon. Sky blue and ivory. My family got it when it was already 13 years old. We had it for 20 more years and climbed all the mountains of Colombia in it. I learned how to drive in it. My brother nicknamed it “la joya” –the jewel. My parents had a 1964 Pontiac Parisienne – it was like driving around in the Queen Mary! I don’t remember having seat belts as my brothers and I used to fight and wrestle as we were driving (and the backseats were big enough that you could lean really far back into the seat and miss the cuff coming from the front seat). It squeaked every time it hit a bump (I was mortified) and the horn would go off at random times. My Mom was tall, and she’d sit ramrod straight while driving, hands on ten and two, and my Grandma was really short and you could only see the top of her head as they drove past – she could only see the tree tops I’m sure. This was a funny thread – hadn’t thought about this in ages! When I was real young (’84 or so), my dad bought a big, honking black Peugeot station wagon, and I loved it to death. It was the first car I’d ever seen that had heated seats (quite rare in the 80’s)! It was a lovely light tan on the inside, and it was a beast. Everyone in town knew us by that car. One of my friends in high school actually offered my dad money for it just because he loved it so much. I, too, learned how to drive with that car. Another thing I remember about it was the cup holders that could detatch from the window – they slipped right into the window well and had a cup holder for a drink and a slotted compartment for a box of candy or granola bar or something. They were so righteous. My first family car was a Rust Bucket. The only thing I remember of that car is it festering away at the side of the driveway. My sister and I loved the thing because it was our playground. We had endless fun clambering all over it, using the rear window as a slide, falling off, and jumping back on again. It also became a leg-up to the tree beside the driveway in the days when we were too short to reach the lowest handhold by ourselves. It was a sad day when we sold it for scrap metal and got a CRV. I loved it when we were still small enough to pack our family of seven into an ’88 Colt Vista. We could just strap one of those big plastic shells onto the roof and we were ready for our summer road trips. The first car I can remember was Moms light green 1963 Chevrolet Bel Air wagon, mostly because one day, in a grocery store parking lot, as she was backing out, a man drove right into the right front door, next to where I happened to be sitting…..I wanted to get out and look, but Mom refused. I would love to find another Bel Air now…….. I loved our family station wagon. Your story about riding backwards looking out the window and distracting drivers behind you, really brought back memories for me. It was AWESOME to be all the way in the back where we “thought” we couldn’t be heard. It was our own little world of AWESOME. Those were the days! I had to laugh about the Chevy Chevette too because that was my first car. I used to call it my Vette, so I would sound cool.